The San Francisco Giants are 2014 World Series champions. It's their 3rd title in 5 years. I just had to write that before anything else was on the page. This post is my first thoughts now that I have finally realized I'm awake. I've never been more proud to be a Giants fan. There was something different this time. After 2010 I felt sweet relief as they finally won one. In 2012, it was thrilling, but it was also Game 4. That team was rolling after beating the elimination odds. There was no stopping that freight train. Plus I was a blubbering mess because that was the year my father passed. But 2014 is different. It's all about love, pride, and the results that come from hard work and a commitment to the right people. A Dynasty has been built by CEO Larry Baer, Senior VP &GM Brian Sabean, and soon to be Hall of Fame manager Bruce Bochy. He's not made of the same stuff as the rest of us. His DNA is different. He's a throwback that gets results in the middle of a specialized age. When Alcides Escobar gave away an out, he allowed Bumgarner to get in to his rhythm and create World Series history. It was the work of a man who would strap a plow to his back and go out in the fields if that's what needed to be done. I haven't done much reading yet. I really have just tried to let it all sink in. Of course I celebrated and watched interviews all night. It was just too surreal for me to focus and read anything. So far today I have read 2 pieces and I encourage you to check them out as well. Here's Grant Brisbee on McCovey Chronicles after Game 7 ended. Like all of his stuff it is fantastic but this one was special. To think he got it up so quickly after the game is amazing. I couldn't say more than "blibbity gibbity goo" after the game ended. Loved the strike zone shots that he showed. Brilliant idea, Bumgarner never gave in and it showed. The other piece I managed to read was from Michael Powell of the New York Times. I'm so glad he went to North Carolina. As someone that had a strong connection with his father through baseball, that was a great story to read. I totally understand Kevin Bumgarner not wanting the company for Game 7. I couldn't imagine how nervous, yet faithful he must have felt. Make sure you read the end. The text message that Kevin Bumgarner sent his son had me in tears. I was super nervous leading up to that Game 7. I wrote about it here and did not hide how freaked out a game 7 made me feel. 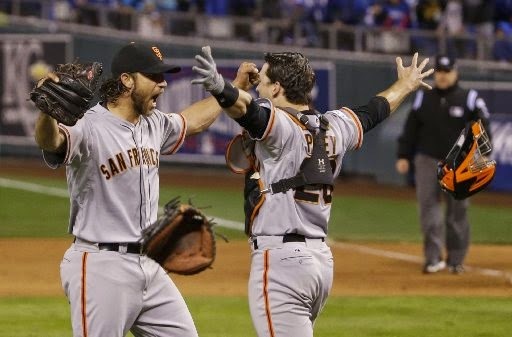 Toss in the fact that the Giants had never won a World Series Game 7 and I was bouncing off the walls. That's what I am still used to. It's so hard to shake as a fan. For so many years the Giants would come up short and it became the norm. I found out before Game 7 that there's a little part of me that still holds on to that. Then I read this Facebook post from Giants 3rd base coach Tim Flannery on his Lunatic Fringe page. I saw it about 20 minutes before first pitch and it snapped me right in to game mode. Love harder and celebrate everything. From there on out my anxiety was gone and I was just trying to put positive things out there. This team doesn't just crawl inside your heart, they become a part of your soul. Post by Tim Flannery and Lunatic Fringe. - Joe Panik was just amazing in the 3rd inning. That play, just holy wow. Off the bat I was sure it was going to be 1st & 3rd. Then he somehow stopped it AND got it to Brandon Crawford in time for a double play. - The catch Juan Perez made on Nori Aoki's fly ball down the left field line cannot be overlooked. That was a perfect confluence of scouting, coaching, and talent. - Michael Morse, thank you. - I wrote about Bruce Bochy as a Hall of Fame manager over on Hall of Very Good before the World Series started. I'm certain that will be reworked and posted here now that the Giants have won 3 titles in 5 years. I'll have much more in the next week or so as I find time to write. There's so many things that happened over the last day, week, month. I can't wait to keep writing and talking about all of them. So look forward to much more and thank you so much for reading again. I also encourage you to head on over to the SFGiants Reddit page. The people there find some great stuff and it's so much fun to share the experience. I tip my cap to those redditors that keep coming over. Thank you. The Giants are the Champs again and as my buddy Wade Black (@EveryFifthDay) tweeted to me last night, "Flags fly forever". A wonderful piece. I share many of your thoughts and views. Will there be a final podcast??? I loved the one you guys did before Game 6!!! Thanks! We're recording right now. Glad you liked the piece.